Stocking your freezer with sauces, soups and smoothies makes dinner quick and easy on busy weeknights, but it can be a pain to defrost a whole bag when you only need a couple of ladlefuls of liquid. A pencil helps you portion out your liquid so you can grab what you need. If you don't have a pencil handy, you can also use a chopstick or handle of a cooking utensil. You just want something that spans the length of the bag, has a narrow width, and can withstand the freezer. This helps you portion out your frozen liquid because the pencil (or other item) creates a divide in the liquid that makes it easier to break off a portion rather than having to thaw the whole bag. Since you'll be folding the bag, you don't want to fill it all the way to the top with sauce. 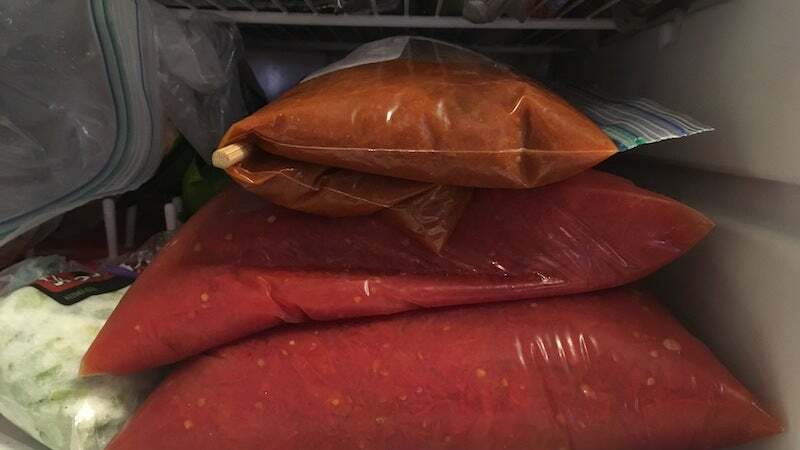 Once you have your sauce bagged, place the pencil wherever you want the portions divided, fold over, and pop in the freezer. I wiggled my chopstick to make sure it made a pretty clean divide in the sauce. Make sure your bag is on a fairly flat surface when freezing. Once frozen, remove the pencil and stack your sauces for more compact freezer storage. Thunder stealer! I thought that was the most logical. Or... don't put so much in the freakin' bag.